First of all, a great big thanks to all of you who voted in the GNMParents.com "Hot Stuff" poll...We won!! I'm sure this award will carry many accolades and future awards (NOT! ), or more likely that it's just really, really cool that this blog was recognized right as it's getting started. So, WOO HOO!!! Now onto bigger and better things, like an awesome dessert I made this past weekend. I am a big fan of Rebecca Rather, The Pastry Queen and owner of The Rather Sweet Bakery in Texas. She has two books out with recipes from her bakery (the new one, focused on Christmas, includes way more than just desserts). 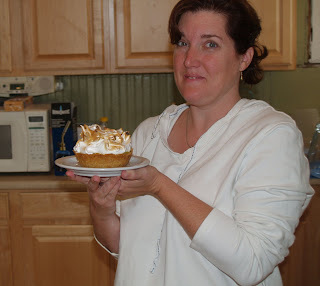 (http://www.ecookbooks.com/p-5819-pastry-queen.aspx) On the cover of her first book is her signature dessert, Texas Big Hairs. Now, I love sweets, and I really love big, extravagant sweets, so this one appealed to me immediately. I've made these "Big Hairs" once or twice before. The general idea is a citrus meringue tart, but better. The components are a nut-based crust, homemade lemon-lime curd, and of course, meringue! I started on Saturday, making the curd by combining sugar, freshly squeezed lemon and lime juices, egg yolks, and a little butter. You combine these ingredients and then stir occasionally of the course of around 40 minutes over a pot of gently simmering water. It's not a difficult technique and the result is so much better than anything you'll ever buy at the store. Trust me. The next day I went ahead and made the crust, which is kind of a pain in the neck. It may be that I don't chill it long enough (patience is NOT a virtue of mine), but I find it annoying to work with. Mine is always a little too thick, but still very tasty. The meringue uses just egg white and sugar, and lots of it. Again you go with a gentle double boiler scenario to be sure to kill any of the nasties in the eggs. Whip on medium high for 5 minutes, the high for 5-7 minutes more. I should have let mine go a little longer, but that patience thing kicked in again. Nonetheless, they are great fun to work with and make look all cool and spikey. The best part? Using a blowtorch to make it all brown and toasty. Woo freakin' hoo ba-by! My Uncle Pat gave me a blowtorch last year after a cooking class. I had been using a wussy culinary torch, with slow & iffy results. He hooked me up using just a regular torch you can get at any home improvement store. SO MUCH FUN! 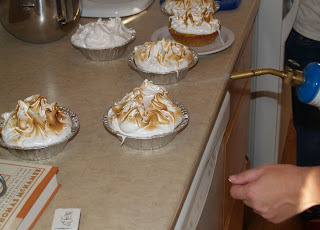 The blowtorch caramelizes the sugar in the meringue and gives it that toasty marshmallow flavor. You can always use the broiler, but this is way more interesting. FYI-This is not something you want your kids to do. Have them help you spike up the meringue, but otherwise, hands off where a blowtorch is concerned. It's just too dangerous for them. I made six and had to start giving them away right away, or else I would have been in a curd-induced coma. Our neighbors Mary Beth & Dan and family had meringue in their hair, on their clothes, and all over their faces in seconds. It was that good. If you like big desserts that are super tasty and don't use processed, canned ingredients, check out Rebecca Rather's first cookbook, The Pastry Queen. Be sure to let me know what you think and if you make anything cool!